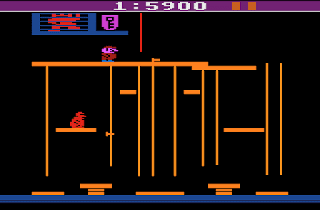 Donkey Kong Junior is a multi-screen platform game that was first released in the Arcades in 1982. Playing as DK Jr. you must rescue Donkey Kong who's been kidnapped by Mario. Three of the four original levels are here (missing the Springboard Stage) and this sequel places more importance on climbing and manoeuvring on vines. These vines provide layers of strategy as trying to climb one is slow; however, grab onto two at the same time and you can advance much quicker. Likewise, the reverse mechanic is used for descending, and you'll need to avoid birds and snapjaws in the process. The first thing that strikes you in Stage 1 is the lack of graphical fidelity with poor animation, badly drawn sprites and a garish colour palette. While it's easy to forgive poor graphics and missing stages, the horrible controls and dodgy collision detection almost ruin the entire experience; DK Junior frequently sticks to platforms and in a game that requires twitch-based movements it's infuriating when he costs you multiple lives by refusing to advance. Part of what made the Arcade original fun was the ability to use falling fruit to your advantage; here, it's entirely absent which eliminates a strategic and meaningful gameplay element. While Stage 2 reduces the number of keys from six to three, its the most enjoyable level here, as there are no platforms for DK Junior to stick to! Everything just works and it's a blast avoiding enemies while trying to push the keys upwards. Stage 3 is a sharp difficulty increase that's wildly frustrating until you realise that DK Junior must be facing a bolt while on a vine in order to avoid them; this isn't exactly intuitive and worst still it doesn't always work as expected, leading to more unfair deaths! If I didn't know better, I'd have sworn that Donkey Kong Junior was a cheap bootleg version, as its terrible controls and general lack of polish scream of a hastily made game. 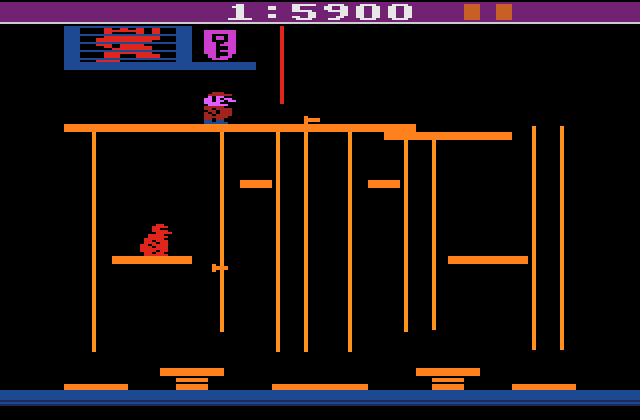 As a follow-up to the respectable Donkey Kong (1982, Atari 2600), the quality here is shockingly low, and there's no reason to play it apart from sheer curiosity. Random trivia: In 1988, the game was ported to the Atari 7800 and includes all four stages.